It’s another day, another morning and the world is getting up and moving. With a cup of freshly brewed coffee in his hand he walks from his house to his work shop. It’s been thirty-three years if not a day that he has made this one hundred foot trek and he is grateful. He is grateful that he has earned a living as a wood worker. He knew then and he knows now that working out in the rat race of the world is not for him. It’s been nearly fifteen years ago that he was forced to make a decision on whether to join that rat race or continue his wood working. Money was tight then and people were not willing to pay for the craftsmanship that comes with real wood furniture. As he opens the door and walks into his workshop, he can still remember the stress the day his wife told him that sales were down. He was working on an heirloom dining table for a customer when she told him. He stopped working and asked her if they could still make ends meet. She looked down and said no, that things were tight as is. His heart was broken as she walked out of his shop. He took his time with that table, believing that it would be his last piece. Towards the end of the day, she walked back in with a huge smile on her face. She walked right up to him and said “You do what you do best, we’ll make it work.” The next day she went out and got a job. Things would be tough, but they would make it through. They made it through. He sat there looking around at all the tools in his work shop. There were chisels and hand held planers of many sizes hanging off the walls. On one wall, there were hand held saws of many kinds and sizes. His father had taught him that sometimes it was necessary to saw a piece of wood with a hand saw rather than using an electric saw. Sure he had an electric tools as well. He had a table saw, router, joiner and drill. But he still liked the feel of the hand held tools as he worked. He had wooden clamps, and plastic ones as well. But the old tools that his father passed down to him and his father’s father had passed down to his father, were still better than those manufactured today. Maybe, hopefully one day he will pass down all his tools to his son. As he walks around the shop, looking at all the various tools, he just shakes his head. He can still remember the day that he walked into his father’s work shop to watch him work. As he prepares for the day’s work, he is transported back in time. In his mind’s eye he can see the day like it was just yesterday. His son, just seven years old, walked into his work shop and asked “Daddy can I help you?” Everyday after school and on weekends, his son worked along side him - as he did with his father so long ago. The thought makes his heart swell. He holds back a tear as the memory continues to bring joy to his heart and soul. There was a time when a son would apprentice under his father to learn the ways so he could one day take over his father’s job. Today, those jobs are gone and a father is lucky if a son takes any interest in his job. He begins his work for the day. Today he is repairing an antique chair for a long time customer. He smiles as he thinks about the customer. But his smile does not last long as he remembers the day when his son came into his shop and said that he was going to college. He was proud that his son was going to college, but his heart was broken as well. Sure he wanted his son to be happy, however, he was hoping that his only son would follow in his footsteps. He wonders if the teachings, lessons and apprenticeship of his craft will be lost with him when he dies. A craftsmanship and legacy gone forever, buried in the abyss that we call our world today. It’s late afternoon and he has finished the chair and is now working on a dresser for a new customer. The door of his shop opens. He believes that it is his wife. Joy fills his heart as his son walks in. He is caring a brief case and a cardboard tube. Although he is excited about seeing his son, his heart weighs heavily as he feels that his legacy is all but gone. After customary greetings and pleasantries his son puts his brief case down on the shop table and opens it up. He begins to pull papers from the tube. “Pop, I took some business courses and music courses. I even took some art courses and ended up taking an architecture course. I think I know what we can do to continue to make more money in woodworking.” states the son. A smile comes over his face as he realizes that his craft, that has been passed down from generation to generation, is not lost. It remains alive within the heart of his son. Deep in the history rich hills of Southwest Virginia, nestled in America’s coal hills Dr. Ralph Stanley grew up not knowing how to play an instrument. The only music he grew up around came from his father, who would sometimes sing church music. Ralph graduated from high school on May 2, 1945 and was inducted into the United States Army on May 16th. Ralph served in Germany at the tail end of World War II. Ralph served eighteen months and then returned to civilian life. When he returned state side, he teamed up with his older guitar picking brother Carter to form the Clinch Mountain Boys in 1946. 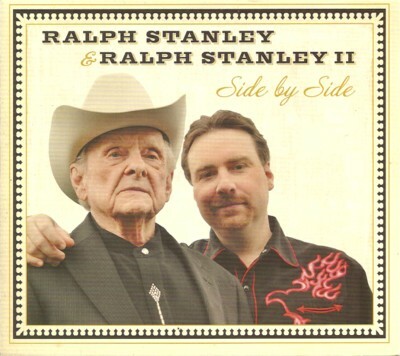 Ralph Stanley’s musical career is written in nearly all of the history books in country music and in Bluegrass. But what is not written is the unique way that Ralph is able to capture the old days filled with ‘mountain’ music and mix it with his unique one of a kind picking stylings. At the age of 87, Ralph continues to tour and perform today. On February 18th, Ralph teamed up with his son Ralph II to release his latest project called Side By Side. This fourteen cut album captures the essence of Dr. Ralph while passing down his well lived and learned mastery of his craft on to his son Ralph II. The album contains more, especially when you know the story. The story of Ralph Stanley is written in stone. Where as Ralph II’s story is not quite written. As a child, Ralph II traveled with his father. He was two years of age when he made his first public appearance on stage during one of his father’s live performances. Since then he has made frequent contributions as a lead vocalist and rhythm guitarist. As much as Ralph II could, he toured with his father. Summer breaks from school would find him on the road. However, he was heartbroken when his father would tour during school. “I started singin’ lead for him when I was about... I was twelve days from turning 16 years old.” continues Ralph II. “My first show was August 8 of 1995 and that was some where in Alabama and that I’ll never forget it. It was the first lead singin’ show I ever did with him. I forget the name of the town, but it was in the state of Alabama and I was just gettin’ ready to get my driver’s license in a few days. Had a birthday and took a dream job at the same time. Traditions and traditional music is what you get with this incredible album. Side By Side features an array of songs that brings you back to the beginnings of The Stanley Brothers, through to the solo days of Dr. Ralph all the way to the apprenticeship of Ralph II. The album opens with a traditional song in “Wild Bill Jones.” It’s Ralph’s time tested lead vocals that bring this traditional song back to the whole some days of ‘mountain’ music. The album continues with “Carolina Mountain Home.” Dr. Ralph first recorded this song back in 1977 for his album of the same name. Today, Ralph II takes the lead vocals while Dr. Stanley adds to this classic hit song with his back-up vocals. The third cut, “Dirty Black Coal,” is the first of four songs that will hit our list of Top Songs of 2014, while earning a nomination for the Spirit Award’s Song of The Year award. The album continues with “Walking With You In My Dreams.” This song was written and originally recorded by Charlie Monroe. However, Dr. Ralph gives a commanding performance with his aged vocals. Ralph II takes the lead in “Don’t Step Over An Old Love.” Performed as a two-step, it’s the mix of the Stanley’s vocals and the up right bass that truly brings life to this classic song. That brings us to the second song that will hit our list of Top Songs of 2014. “Battle Ax,” is your typical Bluegrass instrumental. However, what makes this song so special is Dr. Ralph’s unique clawhammer banjo picking. The seventh cut, “Are You Waiting Just For Me,” is a song written and originally recorded by Ernest Tubb. The song contains tight harmonies while telling the story of a soldier who questions whether or not his girl will wait for him to return. The album continues with a new song for the Stanleys. “White & Pink Flowers” is a beautiful light hearted ballad about the passing of a mother. This too will hit our list of Top Songs of 2014. The Stanleys included a second new song with “Don’t Weep For Me.” Dr. Stanley gives a commanding performance in his cappella version. This is the final song that will hit our list of Top Songs of 2014. The album closes, as it opened, with another traditional song in “I’ve Still Got 99.” Like the opener, Dr. Ralph takes the reigns in lead vocals, while giving the song the feel of yesteryear. In the end, when the last note is played, you find yourself wanting to play the entire album over and over again. This album is a pure masterpiece with it’s artistic purity and is one that we can proudly say is nominated for the Spirit Award’s Album of The Year award. It is one of those rare albums that is filled with a wide variety of stories told through music. From the first note, it captures you and takes you for a ride through years of the history rich hills of Virginia. But most importantly, it teaches you the love that a son has for his father while the father teaches his son the craftsmanship of his time. 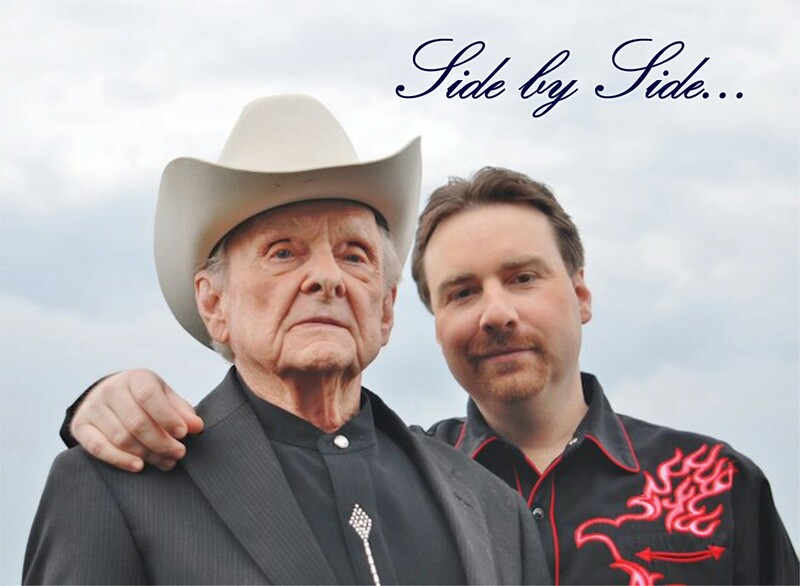 At 87 years young, Dr. Ralph Stanley has no plans of retiring just yet. He may sit on the side lines while his son takes the reigns. However, in reality he is making sure that his legacy, his craftsmanship has been passed down to his son. Like a master woodworker passing his knowledge on to his apprentice, Dr. Ralph is passing his knowledge on to his son Ralph II. But, before Ralph II can become a master himself, they must work together Side By Side.